Backed by an in-the-trenches performance from coding, revenue integrity teams can have a profound effect on hospital finances. It can be argued that the need for hospitals to deploy a robust revenue cycle management (RCM) strategy has never been more pronounced. In a recent study conducted by Craneware, 60% of hospital executives said they believe revenue integrity is essential to their organization’s financial health, while 25% have taken steps to establish dedicated revenue integrity departments. As more hospitals get on board with a concentrated approach to managing all aspects of the revenue cycle, staffers are seeing increased efforts directed at pulling together effective and efficient revenue integrity teams. Who are the best in-house candidates to step into the revenue integrity fold? Maribelle Kim, RHIA, executive director of HIM operations at SPi Healthcare in Tinley Park, Illinois, says a diversified group produces the best team. “It should encompass representation from all departments that create the medical record and those that capture and account for the services provided,” she notes. Such a framework often includes patient access and case management personnel as well as staff members from HIM, nursing, and patient financial services, Kim says. At Long Beach Memorial Medical Center in California, Chief Financial Officer John Bishop says the revenue integrity team brings together representatives from a range of areas, including managed care, the business office’s collections staff, and decision-support professionals. The hospital also leverages a second team of individuals to focus on specific areas. “The ‘pure’ RCM department deals with insurance eligibility issues, accounts that require attention, denials, and strategic pricing,” Bishop says. In general, revenue integrity teams are composed of professionals with financial and clinical backgrounds, says Kelley Blair, senior vice president of professional services at Craneware. A mixture of expertise is leveraged whenever possible, such as when nurse auditors and former clinicians also have financial experience, giving them “the ability to look at the care process and understand what’s happening clinically to better translate it financially,” Blair says. Once the core team has come together, she says the financial and clinical members can help educate each other on how each side’s activities affect the other. “It’s really about bridging the gap between the financial and the clinical areas,” Blair says. Todd Nelson, MBA, a technical director for senior financial executives at the Healthcare Financial Management Association, says most revenue integrity teams incorporate people from internal audit/compliance, HIM/coding, patient access or registration, and patient financial services or billing. Because clinicians have tremendous influence over documentation, he says it may also be helpful to include someone from the specific clinical area the team is working on. For example, when tackling an issue in the lab, Nelson recommends involving a representative from that area who understands the challenges and barriers involved when attempting to obtain accurate information and can also stress the importance of revenue integrity. There’s one more piece of the RCM team that Nelson says can’t be overlooked: someone from the C-suite to lead the charge and remove obstacles. “You need somebody there so they can provide time, resources, and the organizational drive to make sure the revenue integrity team gets the importance that it deserves,” he says. Coders play a significant role in RCM, according to Austin, who describes them as Mercy Health System’s “bread and butter.” Their expertise on issues from “diagnosis guidelines, whether it’s inpatient or outpatient, to where and how to apply modifiers” is instrumental in revenue integrity, Austin says. “That department is probably the most critical,” she notes. At Long Beach Memorial, HIM professionals make significant contributions to the health of the revenue cycle. Their participation on the revenue integrity team stems largely from their role as “the ones who ultimately turn the services we perform into a patient bill,” says Bishop, adding that accurate, thorough coding is needed if the hospital is to garner the maximum reimbursement for every instance of care. “The ability of an effective coder to capture all of the comorbidities of a given patient enables us to document the level of patient acuity that is essential to ensuring we receive appropriate reimbursement,” he says. Nelson says today’s coders provide expertise in a multitude of revenue integrity areas. Activities such as identifying deficiencies in documentation and registration information often fall to the folks in HIM, he notes, adding that without a thorough understanding of how and why these problems occur—and what can be done to resolve them—the hospital’s revenue could suffer. Because they’re in the thick of the reimbursement process, coders have a strong knowledge base. “They know what’s working, what’s not working, and what’s getting rejected when they’re adding those codes into the billing process and passing them through,” says Nelson, who believes educating others in the organization on issues related to coding may be key to a revenue integrity team’s success. Because HIM has historically been focused on its own operations and coders are tasked to perform at high productivity and quality standards, Kim says they are often too busy to completely comprehend their crucial role on the revenue integrity team. “HIM leaders and coding managers should routinely share information and reports with their coding staff, such as trends and fluctuations in CMI [case mix index], CC [complication/comorbidity], and MCC [major CC] capture rates, denial rates, DRG [diagnosis-related group] analysis, and other reports demonstrating their daily responsibilities in the medical record abstraction and code assignment, and their impact in the organization’s finances,” she says. If coders understand where they fit within the revenue cycle process, they’ll be better able to leverage their expertise as integral members of the revenue integrity team, Kim says. Blair believes the role of coders is actually beginning to expand into other realms of the revenue cycle, such as fulfilling the need for a chargemaster manager. “What we’re seeing from a trend perspective is more hospitals requiring that their chargemaster person actually have some coding certification and that they have a good understanding of the coding and how the services fit together,” she says. While this is an evolution from the days when people working with the chargemaster were selected solely for their finance background, Blair is quick to add that the traditional roles coders held within the RCM process haven’t diminished in importance. Individual empowerment is also crucial to a high-functioning RCM department. “This makes them feel like they’re part of the process and as everything comes together as a whole, they can see how it all fits,” Austin explains. With so many different disciplines working together, keeping everyone on the same page often requires skillful coordination. “There are definitely competing priorities, but the reality is if you want the groups to come together as a team, you need somebody at the executive level,” says Nelson, who encourages management to set the tone. While Nelson doesn’t believe leadership needs to attend every meeting, he says it must demonstrate that revenue integrity is an organizational priority, a stance he believes gives the team more leverage to overcome obstacles. Ensuring the various players view RCM as a collaborative effort is another way to keep people moving forward toward a common goal. Offering tips to help increase revenue typically garners better results than simply pointing out where errors are occurring, he adds. She cites an example in which a hospital’s nursing staff wasn’t consistently documenting infusion stop times. The revenue integrity team reviewed the data and identified how many charges they had been unable to bill. As it turns out, the facility was losing around $20,000 per month in reimbursements as a result of the poor documentation. When the nursing staff was informed the amount being lost was likely enough to cover two nursing salaries, the motivation to cooperate in the revenue cycle process increased tremendously. “That’s what we’re talking about here. We’re talking about the ability to add resources and to invest in care,” Blair says. During these dicey economic times, hospitals are aggressively looking for ways to reduce costs and maintain revenue. Nelson believes a well-executed RCM program has the capability to directly and positively impact an organization’s bottom line. “Putting together a revenue integrity team is an integral part of making sure that, from a compliance and a revenue capture perspective, you’re getting everything that’s due your organization,” he says, pointing out opportunities to reduce denials by ensuring codes are assigned appropriately and will stand up under scrutiny when submitted to the various payers. Healthcare organizations focused solely on the here and now are being shortsighted, Blair says. “It’s about impacting the bottom line now by doing it accurately but also impacting the data that’s going to be used to make future decisions about reimbursement to the hospital,” she says. Not only will automation make the process run faster, it’s also likely to be much more efficient, says Kathi L. Austin, CPC, CPC-H, CCP, executive director of revenue integrity at Sisters of Mercy Health System in St Louis, where most of the revenue cycle is automated. “By automating the cycle itself, you’re going to eliminate duplicity that’s probably rampant,” she says. Because fields can be autopopulated, Austin says a decrease in claim error rates is a real possibility, adding that she wouldn’t be surprised to see the revenue cycle process streamlined to such a degree that a few steps can be consolidated or even eliminated. It all adds up to greater profitability. “I think you have an acceleration of reimbursement because you’re going to be increasing your efficiencies,” Austin says. 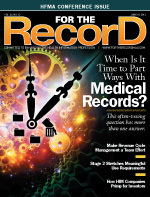 John Bishop, chief financial officer at Long Beach Memorial Medical Center in California, agrees that efficiency and accuracy are boosted through automation, describing it as a tool that enables the revenue cycle management team to focus on strategic opportunities to improve revenue integrity. Nevertheless, he doesn’t envision a time when the entire revenue cycle process is automated. “It is unlikely that the revenue cycle will ever be completely automated because the dynamic landscape of healthcare reimbursement may not allow it to occur,” Bishop says.